This is a separate aircraft that uses the ThirdWire SF2 F-16A_Netz lods and cockpit/avionics. It contains the relevant .ini files to convert it to USN but you must have at least whichever SF2 game(s) gives you the F-16A_Netz, such SF2 Israel and SF2 NA for the F-14A decals. It is in .jpg format for SF2. INSTALLATION: Unzip to a folder/place of your choice. 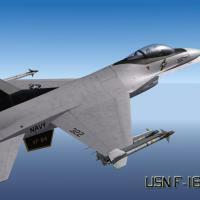 Copy, Move, Drag-n-Drop or do whatever you wish to get the F-16N folder into your aircraft folders. Choose the desired skin in the loadout section. Fly. I'm releasing this under the Combat Ace Fair Use Agreement. Use it anyway you wish for personal use. For any other use, please contact me first. If you find any problems with it, please PM me. If you improve it, please PM me a copy. Thanks to all who are helping me learn to skin by direct involvement and/or by inspiration. If I forget or miss anyone who deserves credit for anything I release, I apologize. I have no intent to abuse or misuse anyone's property or claim it as my own. Please contact me to correct any error.